P.F. Candle Co. Sweet Grapefruit Diffuser is ripe and fresh grapefruit pairs with sweet notes of peach and tangy mangosteen. Bright and energizing, it’s one of PF's strongest fragrances! Top Notes: peach, mangosteen, pink grapefruit, lemon zest. Heart: yuzu petals, orange, mandarin. Base: musk, teak. P.F. 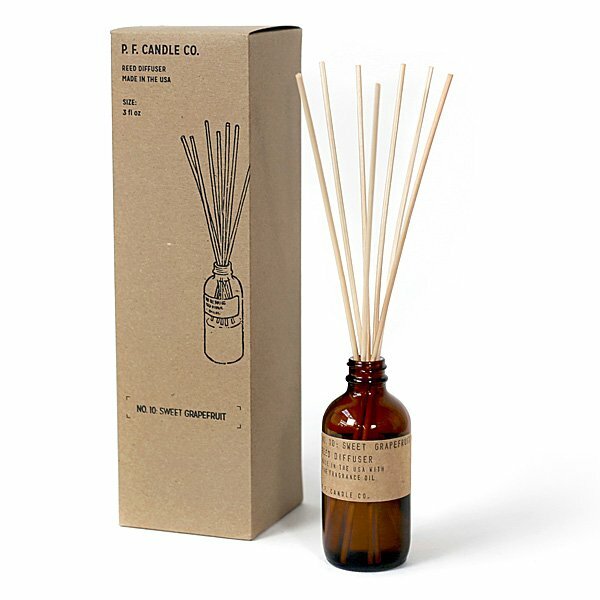 Candle Co. Diffusers are naturally harvested rattan reeds that absorb the scented oil, releasing it slowly through your surroundings. Poured into a simple apothecary-inspired bottle and packaged in a recycled content kraft paper gift box, these diffusers will last 2-3 months. Flip reeds weekly or when the fragrance becomes faint.